How to Download YouTube Videos Mac: YouTube Video Downloader Mac. How to Download YouTube Videos Mac? YouTube is a welcome video sharing site, allows you to enjoy many nice videos. But you can not Download YouTube Videos Mac directly! Is there a perfect way to save and Download YouTube Videos on Mac so you can enjoy them without limit? This tutorial will introuduce you a powerful YouTube Video Downloader Mac , which supports downloading YouTube Videos Mac. Total Video Downloader for Mac is an excellent Youtube Video Downloader Mac specially designed for Mac users to Download YouTube Videos Mac easily and quickly. With this wonderful YouTube Video Downloader Mac , you can enjoy your favorite videos anytime and anywhere. How to Download YouTube Videos Mac with this YouTube Video Downloader Mac? You can download the YouTube Video Downloader for Mac by clicking above "Download YouTube Video Downloader for Mac" icon, then install Total Video Downloader for Mac on your Mac by just few clicks. After installed, this YouTube Downloader Mac will run immediately. Then follow the tutorial below to start downloading YouTube Videos Mac (Yosemite included). 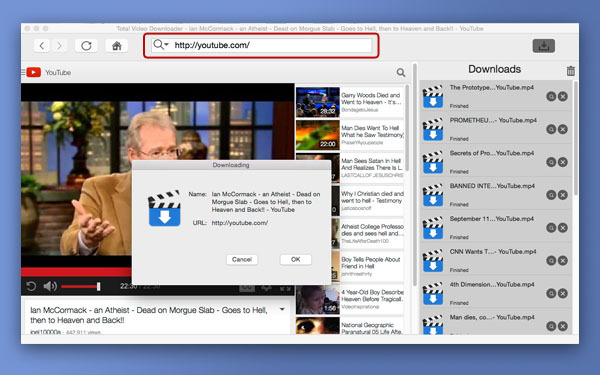 Download YouTube Videos Mac Step 2: Launch this YouTube Video Downloader Mac and select the target Video. You can directly copy and paste your favorite YouTube video URL to this ideal YouTube Video Downloader for Mac, then tap "Enter"! As Total Video Downloader Mac has a built-in browser, you can also browse YouTube site with this Youtube Video Downloader Mac, look for and play the video you want to download. When you start playing the video, the YouTube Video Downloader Mac will pop up a download box to ask you to confirm your download! Download YouTube Videos Mac Step 3: Tap "OK" to start downloading YouTube Videos Mac. When the download box pops up, just click "OK" to start downloading YouTube Videos Mac. We are happy to tell you that you can download mutiple YouTube videos on Mac at one time, this will save your time! With this excellent YouTube Video Downloader for Mac, you can pause or cancel ongoing downloads. It also supports resuming of interrupted downloads. Download YouTube Videos Mac Step 4: Find the downloaded videos in the “Movies” Folder of the system. When the YouTube Video Downloader for Mac completes Downloading YouTube Videos Mac, you can click the "Magnifying Glass" icon. 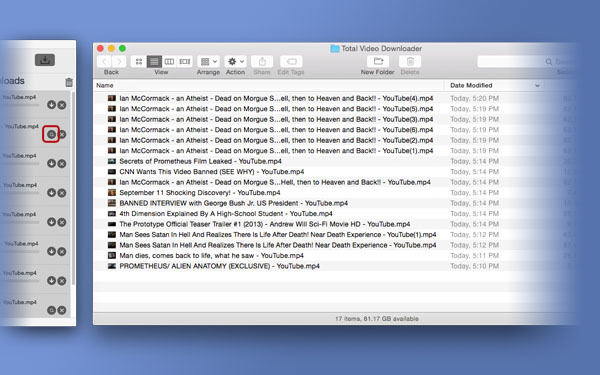 This YouTube Video Downloader Mac will locate the downloaded video in the “Movies” Folder of the system, thus you can easily find the YouTube videos you downloaded and enjoy them anytime and anywhere.